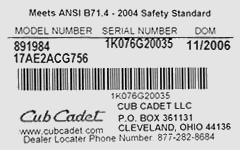 The model and serial numbers are essential to find correct Cub Cadet® genuine factory replacement part numbers for your outdoor power equipment. Once you know these numbers, you can use our Part Finder or the operator's manual download to easily search for the correct part numbers needed. Identification tags are located in areas unlikely to need replacement - even after years of use. For most of our power equipment, these tags are approximately 2" x 3" in size. They also have the Cub Cadet product's name, address and customer service phone number listed across the bottom. Walk-behind model and serial number plate is located on the rear left side of the deck. Tractors Riding mower model and serial number plate is located on the underside of the seat. Tiller model and serial number plate is located on the tine housing. Single-stage snow thrower model and serial plate is located on the units frame, near the belt cover. String trimmers have a small model and serial number sticker located on the units starter housing. Leaf blowers have a small model and serial number sticker located on or around the starter recoil assembly. Chainsaws have a small model and serial number sticker located on the handle. Log splitter model and serial plate is located on the frame of the unit, beneath the engine. Hedge trimmers have a small model and serial number sticker located beneath the battery. Utility vehicle model and serial plate is located on the underside of the driver-side seat.